As a customer, I am constantly amazed by the creativity and inventiveness of digital scrapbook designers. There are products available now that I would never have dreamed of when I first started digi scrapping in 2006. One product that I have been enjoying are the cluster and paper stack templates. For some reason, I’m finding it hard to describe them, but I’ll give it a try: they are layered templates where the designer provides the layers for the cluster or paper stack but it is not a “complete” layout on its own. So, the templates are a good starting point for a layout and allow each scrapper to creatively “fill in the page”. The reason I like these templates is that they let me quickly start a page while at the same time giving me enough room to put my own creative touch on the page. I used a paper cluster template by Chelle’s Creations (shown above) as a starting point for the layout. I loved that I was able to quickly drop the paper strips onto my page and start clipping papers. I resized some paper strips and removed some layers – they’re very versatile tools. For the page above, I started with a paper stacker template by ad77 designs and then added photos and other embellishments to suit the photos. It came together very quickly. I used ad77 design’s paper stack template again for the following page, where I combined it with a white-space style template by Zinnias and Swallowtails. I think there is a place in my digi supplies for both full templates and cluster and paper stack templates. They are excellent page starters for when I need a little help with capturing my family stories. PS #1 – All the product previews and layouts in this post are linked to sources/credits. PS #2 – The title graphic was made using products from The Daily Digi member exclusive kit My Life In Print and fonts 4990810 and Jonny Quest Classic. Instagram is now available for Android users as well as iPhone users! Blogging as a form of digital scrapbooking? You bet! Jennifer Wilson joined the digi show this week to discuss the technical ins and outs of blogging. What platform we prefer and recommend, should you buy a domain name and how, and so much more. We even share some ideas on how blogging can help with memory keeping. Tracey Monette of Clever Monkey Graphics releases her brand new Easter kit, Bunny Ears this Friday. Be sure to check out her store for all her returning Easter kits which cover everything from egg decorating to those who want a more religious feel in their layout. If you’re hooked on books like Pink Reptile Designer Mirjam is, then this is the perfect kit for you! Beautifully textured patterned papers with a retro feel and colour-scheme and matching solids, 2 felt alphas to create awesome titles with a handmade feel and 57 unique elements in different textures, shapes & styles is everything you need to create some stunning pages! Studio Basic has moved to a new store and has a new freebie to share! Jennifer Labre is celebrating her 2nd design anniversary! Heather T. has 2 new template packs out this week: A Year of Hope: Templates 3, & 4! Cindy Schneider has these new fun, versatile frames at the Sweet Shoppe, both the frame templates and chipboard frames are included. They are a perfect addition to any layout! Liz has a new set of templates out that were inspired by wallpaper. All of the templates in this set feature ornately shaped clipping masks and mats. Plus she has an awesome free with purchase. If you purchase these you’ll get a set of NEW ornament masks for FREE! WMsquared has this fun new kit 20% off for 1 week, in addition to getting a FREE font with purchase! Misty Cato’s latest release, Heartsong, will bring the melody of vintage beauty straight to your pages. Mari Koegelenberg is excited to share her New Store at Sweet Shoppe Designs. She has a Sweet Freebie just for you. Be sure to check out the Shop during Easter Weekend, 6-8 April 2012 for some yummy New and Classic releases. Do you love your garden and all it’s inhabitants? 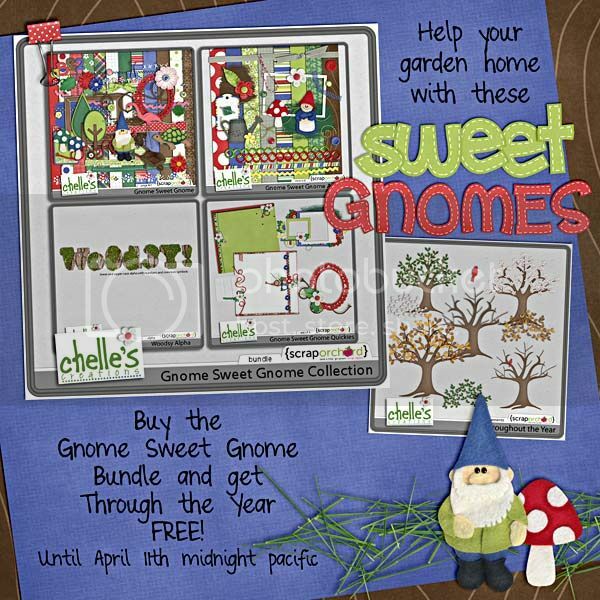 You’ll love this new release from Chelle’s Creations! If you received the March Daily Digi Files you will have in your stash the JUST ANOTHER DAY DESIGNER KIT. Made to coordinate with that is my latest release JUST ANOTHER DAY DOCUMENT PACK which is great for anything Project 365 related or can be used to add some stylish journaling to your layouts. It is 20% off all Easter long. MLE Card’s new release this week is 20% off and there is a FWP offer when you buy the kit you get a coordinating alpha free. Sweet Shoppe Designs is excited to welcome the following talented ladies to their team: Erica Zane, Studio Basic Designs, Mari Koegelenberg, Jady Day Studio, Nettio Designs and Sugarplum Paperie. To celebrate their veteran designers have teamed up with their newest additions to create limited edition Petit Four collaborations. Stop by this weekend and pick them up at 20% off! shoppe! Hop on over and grab it at 20% off this week! ViVa Artistry tackles Commedia dell’Arte in this fun yet elegant collection . You’ll love the sweet illustrations of Pierrot with the clean black/red/yellow tones in this vintage styled kit! Great for layouts of children, Cirque du Soleil, or whatever else your imagination leads you to. Let the show begin! Just in time for a quick Easter or Spring gift go grab this bunny basket printable from Krisi’s Kreations and Chelle’s Creations! Save 20% by using TDDSavesU20 until Sunday. Baers Garten Designs has a new store at www.baersgarten.com/digi Come to visit and celebrate the new opening with the coupon open30 for 30% off your purchases through April 15th. Yin has four new templates in her store, and a free one on her blog! Designs by Lili has a new pack of journaling cards and these amazing photo templates! On sale all weekend at The Lilypad. Splendiferous is the newest template pack from Jeanye Labaya and is 20% off through Sunday the 8th. Kate Hadfield has a fun new set of Easter themed doodles as part of The Lilypad’s April BYOC! Egg Hunters is 20% off all weekend! Brand new Spring/Easter Kit plus a great FREE GIFT with purchase from Peppermint Creative. Save 20% on this kit and 35% off all Spring & Easter products only until midnight EST Friday April 6th. Michelle Batton is guesting at The Digichick this month! She has released a whimiscal, Mexico-themed collection called La Fiesta, as well as eight sets of do-it-yourself journal card templates that allow you to create 3×4″ journaling cards to coordinate with any kit! Stolen Moments has a BIG spring cleaning sale going on! Dani Mogstad is having a creative team call! Well, I bet this post will keep you clicking for awhile. Hope you have a FUNtastic Friday! Layout by Kimberly. Supplies: She Kit by Dunia Designs; Coffeeshop’s Sun Kissed Photoshop Action; Staple by Crystal Wilkerson; Fonts: Hero, Bebas, Impact. Layout by Jacki. Supplies: She Kit by Dunia Designs; Fonts: Serendipity by CD Muckosky. Layout by Heather. Supplies: She Kit by Dunia Designs; Ratatouille (template) by Jeanye Labaya (NeeNee), Realistic Drop Shadow Styles by Sahlin Studio; Font: The Amy by Heather Hess. Layout by Anne. Supplies: She Kit by Dunia Designs; Fonts: handwriting-draft (free version) and American Typewriter. My name is Dunia, I live in Brazil with my DH, my 8 year old son Yuri, my 2 year old twins Eduarda and Rafaela and my two dogs. I love books, scrapbooking and photography. I’m in love with Project Life, for the last two years I made Project 365 and I have to say it’s awesome but I was tired about photos 365 days in a year, so I discovered Project Life and fell in love with it. I still take many photos but now I have some days off 🙂 and I love to write on it, it’s really an amazing project! I start as a scrapper about 4 years ago and I year later Loreta Labarca invites me to create for the first Brazil digital scrapbooking store, and after that I never stopped. Mostly my kids, they colors, toys, clothes everything in they world is so colorful and amazing, somehow I try to pass this to my kits. I love to create palettes from the stuff in Pinterest, I choose some images with coordinating colors, put them together and make my kit palette. Here are some more inspirational layouts using Dunia Designs’s products. All of the layouts are linked to the originals with credits. Exclusive coupon for The Daily Digi Readers! Save 30% at Dunia Designs’s store with coupon code TDDrocks. Expires 05-01-12. Go have a look in Dunia Designs’s store! We will randomly select a winner from the comments to win $10.00 in product from her store! (Comments must be posted before midnight EST to qualify)! While there’s no reason that you have to scrap about the season or holidays happening right now, I find that I often feel motivated to create pages centered on the what’s currently happening around me. I have a hard time wanting to scrap about Halloween when my calendar says April, even though it’s perfectly fine to do so. I figure that it’s better to go with this creative flow than to fight it, so right now I’m in a spring & Easter scrapbooking mood! Pastel colors, bunnies, candy, and cute little chickies all make me happy that Easter is almost here! My favorite part of Spring has to be the beautiful flowers! I love that little kids can wear bunny ears, spring clothes, and Easter finery at this time of year. Butterflies and spring flowers aren’t only for girls, I put them on my son’s scrapbook pages too! Easter and spring holidays are filled with traditions and special memories to document. Spring has such a soft and sweet feeling, I love seeing that captured on a scrapbook page! Easter eggs and candy come in such bright and vivid colors – this results in stunning photographs! I love how new and fresh everything feels in the springtime. And how about Spring Break? It’s always nice to have some time off or to go on an adventure! I hope you are full of springy inspiration now – I know I am! A couple of weeks ago, I was able to join almost 100 digital scrapbookers in Vegas for Digiscrapapalooza! Among those there were a lot of members, readers, and listeners to The Digi Show. I was also fortunate to meet our team members (from L to R above) Jenn Lindsey, Katrina Kennedy, and Trina (I’m in the solid black). It was so fun to spend time visiting with my team members about digital scrapbooking, photography, and real life stuff! I was joined by my real life, digi scrapping friend, Alicia and can you believe, I don’t have any photos of us together!? I got photos taken with lots of readers and listeners (I’m still hoping they will send me copies…pretty please). One of our readers, members, and listeners was quickly loved by all. Joyce is hilarious and had me laughing so hard, that not only did my mouth hurt, but my whole head! It was a joy to meet and visit with her. I took Katrina’s photography class and finally, finally moved my camera to manual mode! Woot! We recorded a live Digi Show my last night there. It was a fun show, filled with lots of questions for designers and business owners. I felt a bit frazzled taping the show live, especially with that many panelists. Liz Moss was on the green team with me (a big thanks to Chelle for all of her work on our team stuff) and so I accidentally introduced Liz Albers (Scrapping with Liz) as Liz Moss (sigh). It was a super fun time and I am so glad I was able to go. A big THANKS to Kami, Mel, and the Scrap Orchard crew for going above and beyond. Also, thanks to Chelle and the rest of the GREEN TEAM! It really is fun to put faces and voices with all of the names! Yesterday, I sent an email to members that the Playbook is now available in iBooks format! I’m really excited about this addition to our lineup for members. The iBooks Playbook can be downloaded directly in the members area from your iPad and will open directly in iBooks. We are also working on a Kindle Fire and Nook Color versions. Last week, I shared some tips with our members on getting around the site. These were things that our members had asked for in a recent members survey, but are already features on the site. I figured if our members don’t know about them, then our readers might not either. So, I thought I would share them here too. First up, I’ve had several requests for an easy way to access the designers features at the end of the month. This will help you be able to get to those designers’ coupons you all love! If you go to the home page and click on “designers” that will take you to a page that has previews for all of the items included in The Digi Files. They are added as they are revealed on the home page. They link back to the original designers’ features with those coupons at the end. Another member mentioned that they wish there was a way to see all of the designers that had contributed to The Digi Files in the past. They have come to trust our recommendations and are overwhelmed by the amount of designers to choose from. If you go to the home page and click on “Past Designers” in the side bar, you will find a list of all of the designers that have contributed by the month they were featured (most recent on top). The list is linked to their stores and we try to keep it as up-to-date as possible, but with over 170 different designers, it isn’t always perfect! Someone said they would love a way to pull up all of Katrina’s photography posts. To pull up all of the posts by any author, just click on their name under the post title. I had my programmer set it up so the author names/links come through your reader as well. We also have all of the posts categorized. All of Katrina’s Photography posts can be found in the photography category. There are a few posts by other authors in that category as well. Don’t be afraid to click around the site and see what you can find. You just might be surprised what you discover! The is just ONE of the collections included in The Digi Files and Digi Game this month. With a subscription to The Digi Game, you get SEVEN full collections from different designers, an interactive Playbook, (available as a PDF and NOW available as an iBook too!) and access to exclusive collections for only $7.50 a month! Staple by Crystal Wilkerson; Fonts: Another Typewriter. Layout by Tara. Supplies: Find the Joy by Tickled Pink Studio; In Stitches Layered #10 (template) by Robin Meierotto; Fonts: DJB Digi Tara. Layout by Trina. Supplies: Find the Joy by Tickled Pink Studio; Just Us template by Captivated Visions; Fonts: DJB Get your Fix and DJB Smarty Pants by Darcy Baldwin. Layout by Heather. Supplies: Find the Joy by Tickled Pink Studio; Ratatouille (template) by Jeanye Labaya (NeeNee); Realistic Drop Shadow Styles by Sahlin Studio; Font: The Amy by Heather Hess. Hi, I am Becca Bonneville, designer behind Tickled Pink Studio. I am a font addict who loves all things typography, graphic design, and just being creative. I live in Southern Illinois with my wonderful husband and three kiddos. When I am not designing I am spending time with my family or getting lost on Pinterest. I have to admit that I can get easily carried away with scrapping girly pages. I LOVE girly things and find myself having a TON of pages of my daughter and not as much of my sons. When I created the Beep.Bop.Boop kit I thought it would be great to finally scrap something of my youngest son, Ethan. Just a tip: When using graphics like the robots in this kit, it is fun to incorporate them in different ways like how I have the robot holding the photo in this layout. It gives the graphic more interest (versus just sticking it on the page) and adds a little fun. I started digital scrapbooking in early 2008. I have never done paper but was beginning to learn Photoshop when a dear friend introduced me to digi. I was hooked immediately and haven’t looked back since. I started my adventure in designing when I became a part of the Little Dreamer Designs Apprentice program. The Apprentice experience was a fabulous way to get my feet wet. I was able to learn from one of the industry’s most amazing designers, Michelle Coleman, which was such a treat. After LDD I went to Two Peas in a Bucket and am still a designer there. I have always been a creative person. I get inspired by everything from print ads to fashion. I love playing with colors and drawing in Illustrator. Computer: I currently use an HP TouchSmart 600-1150qd. It has Windows 7 Ultimate (64-bit) with of 8 GB RAM. I also use an 1 TB Western Digital EHD for extra storage along with it. Program: I use the Adobe Design Premium Suite CS4. Anything Else: I use a Wacom Bamboo tablet but am looking to upgrade to the Intuos. While it is fun to get caught up in using yummy papers and fabulous elements, don’t forget what using a great brush can add to your pages. Brushes are wonderful for adding some depth to your pages and/or interest behind a photo. Have fun playing with splatter brushes or a fun bubble brush. My favorite product is one of my most recent kits. I teamed up with the amazing Penny Springmann and we created a fun kit made for the everyday. The kit is using some of the hottest colors for spring (which are fabulous!). It was fun making such a happy kit to capture those everyday moments and to work with not only a great designer but a great friend. Sunshine & Happiness was my first full kit created at Two Peas in a Bucket. It was a dreary winter in Illinois and I was feeling the need for a little sunshine, thus Sunshine & Happiness was born. I wanted the kit to be filled with happy colors and whimsical elements to help chase those winter blues away. Go have a look in Tickled Pink Studio’s store! We will randomly select a winner from the comments to win $10.00 in product from her store! (Comments must be posted before midnight EST to qualify)! We are launching a new issue of The Digi Files today, no joking! Many of our annual members were able to start downloading their goodies once the calendar turned to April 1st. Our monthly members will start downloading as soon as their payments process through PayPal. Why don’t we show what’s in the files at the beginning of the month? There are lots of reasons, but the biggest is that our members LOVE the surprise! The have come to trust our quality and they love downloading and unzipping before knowing what’s in there. While I was in Vegas, I had member after member come up to me and tell me that they feel like it’s Christmas or their birthday on the first of each month. They each won $10 in product from one of last month’s contributors! Melissa L. was the random winner chosen from Monday’s feature on Designs by Anita. She won $10 in product from Designs by Anita. We have some EXCITING news coming up for members very soon! I can’t wait to share!